For those who didn’t know, I’m not only the editor of Southern New Hampshire Kids, but I’m the former founder and editor of Extreme Coupon Professors! That site was a lot of fun showing how to get the best deals, teaching readers how to save tons of money etc. I’ve been able to take a lot of those things from ECP and bring them here to our new site. I’ve always kept busy with my family doing things, going places having lots of fun, but doing it 98% of the time with a deal! With a family of 7 why would I want to even attempt doing things without a deal! Couptopia was and is still most often my go to for fun and deals! From eating out, to spas, to activities, to going away– Couptopia is my first stop. If you haven’t been to their site, I definitely recommend it. 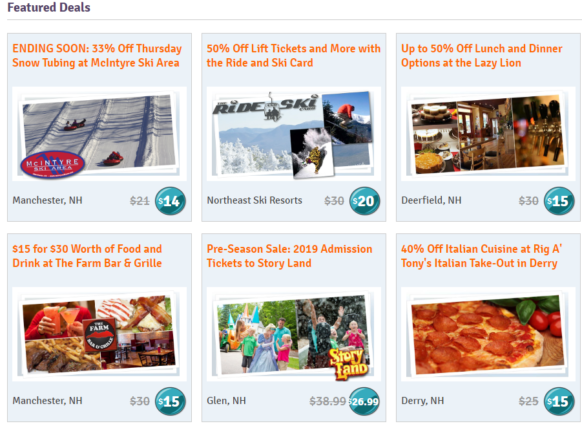 Right now they have lift tickets, snow tubing, a pre-season ticket sale to Story Land and many more. So hurry and take a peek, some deals are ending soon! I’ve always said our family goes where the deals are. Also, sometimes I have to purchase those deals off season to get the best prices. Check ’em out HERE and plan your fun! « Party Palace-Dreams Really Do Come True!